Pain in the ball of the foot, or shooting pain in the toes. One of the most common diagnosis of these symptoms is diagnosed as a neuroma. 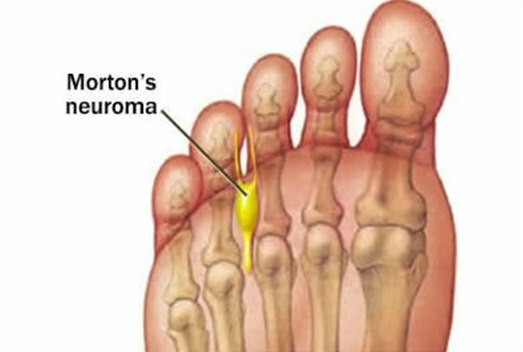 Morton’s Neuroma has several similar names; Mortons Metatarsalgia, Morton’s Neuralgia, Plantar Neuroma and intermetatrsal Neuroma. It is a benign bundle of nerve, most commonly of the third and fourth toe webspaces but can occur in any of the webspaces of the forefoot. Typically this is characterised by numbness and shooting pain into the toes and burning sensations on the ball of your feet. The pain is often relieved by removing footwear, massaging or rest. Symptoms are exaggerated by walking and exaggerated by exercise. Other diagnosis of shooting pains in the toes include; Diabetes, Anaemia and Radiculopathy, so it is very important to seek advice from a foot specialist if you develop any of these symptoms. Direct pressure applied between the metatarsal heads should replicate the symptoms. Forefoot squeeze test known as a mulder’s click. An ultrasound examination or X rays may be requested to rule out differential diagnosis such as stress fractures. How can our team help you if have a Neuroma? Orthotics to open out metatarsals pressing the nerve and reduce the mechanical load. One or more Corticosteroid injections. If conservative treatments fail, patients may be referred for surgical intervention.